SlyFox and Business London are excited to begin a new PR partnership allowing our clients more visibility online and in traditional news media. The first of many upcoming features were published in Business London magazine and in the London Free Press in October and November 2018. So far, we’ve had two months of promotions in Business London magazine and the London Free Press and we have many more in the works! 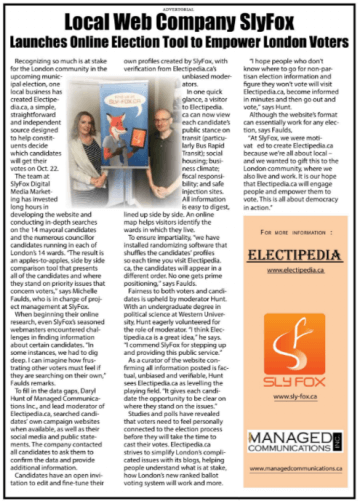 Our first feature was an extended article that explained our work with Electipedia.ca which helped provide crowd-sourced election information on candidates in the 2018 London municipal election. 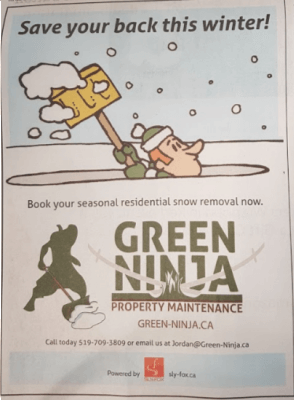 After that, we had the opportunity to promote one of our very special clients: Green Ninja Property Maintenance. 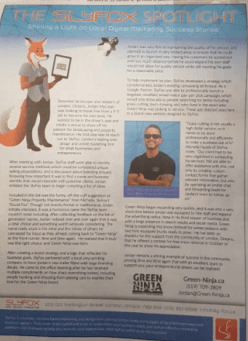 This feature explained our relationship with Green Ninja in detail covering everything from the beginnings of our professional relationship, logo and branding designs, website promotion and client outreach. Not only was our client proud to be featured we were very glad to show the real benefits our digital marketing services provide local businesses. Stay tuned for many more features and contact us if you’d like to learn more!